I'll admit it: Before Kanye West started dating Kim Kardashian, I could never decide how I felt about him. But once I got to see him in action as a dad to North and Saint, it was a done deal. With every photo captured by paparazzi or by Kardashian on Instagram, it becomes more and more evident that West is loving that fatherhood life, and he seems pretty good at it, too. And among all the reasons to love West — his music being just one — so many of them have to do with what a great dad he is, and obviously his wife feels the same way. On Sunday, Kardashian wished West a happy Father's Day with the cutest family photo. In the pic, West is standing on the beach, holding Saint with North at his side as they watch their mom lay on a surfboard. It's such a sweet vacation moment, and Kardashian took the opportunity to thank West for what he does for her and their kids. She called him the "best dad," and after seeing him interact with his kiddos on Keeping Up With The Kardashians, I have to agree with her. I mean, just look at this! So cute — and it's definitely not the only time West has been spotted being the cutest dad ever. Here's more proof he's deserving of a World's Greatest Dad trophy. And trust me, these moments are more than enough to turn anyone into a fan. This photo was taken during their family trip to Vail. If you think you have seen cuter things than this family walking through the snow hand in hand, you are wrong. Although let's be honest: North is probably a baby genius, so soon she'll be reading to him. 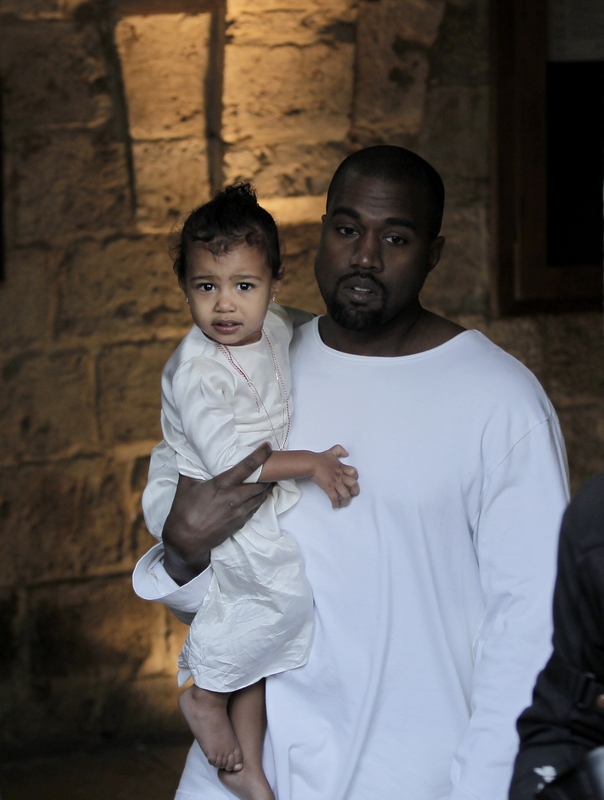 West never looks happier than when he is with North. Except for maybe when he's eating ice cream. They're busy people, so I totally get it. And I do envy their ability to fall asleep in the middle of a store. These two are clearly best friends. Look at that grin! I feel like this needs to be an oil painting that hangs above their fireplace. No matter how busy West's career is, he never misses an important moment in North's life. How cute is this?! North gets some serious credit here, because at that age, I would have been terrified of that guy. So many family outings for these three! I can't wait to see how North and West's relationship continues to grow as she gets older — and to see what happens as Saint gets older and he's in the mix, too. I'm so ready for adorable daddy/son moments!